IPOB: Ohaneze's Restructuring Summit in Awka is orchestrated to keep enslaving Biafrans! The attention of the Indigenous People of Biafra has been drawn to the restructuring summit organized by Ohaneze ndigbo led by Nnia Nwodo scheduled to hold in Awka on 21st of May, 2018. 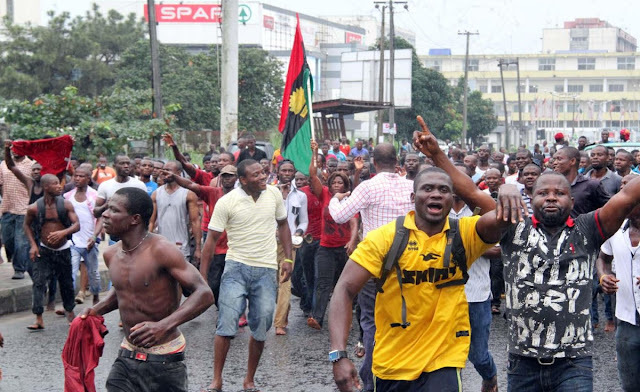 Following the role played by Ohaneze leaders in the October 2017 "Operation Python Dance" that led to the killings of unarmed youths in Biafra land coupled with the proscription of the activities of the Indigenous People of Biafra, the Indigenous People have also proscribed every activities of Ohaneze especially when it is anchored to discuss restructuring of the failed country, Nigeria. As the "hand shake across the Niger" summit which held in Enugu ended abruptly, the Awka summit will not hold at all. It is the process of changing the policies made by the Indigenous People like devolution of powers to the regions and allowing then control their resources. Sadly, the restructuring is not backed by any Nigerian or international law, how will someone believe that restructuring will work under the Nigerian government especially the northern Nigeria which will always perceive the process as enthronement of self determination which is almost a yes to Biafra restoration. Nnia nwodo cannot enforce his will, on the people. It is an act of dictatorship and it is the people's right to speak or protest against it . The Indigenous People of Biafra are not detered since Nnia Nwodo connived with the Fulani Nigeria armyy to shoot and maim Biafrans who oppose his decision. His stance has emboldened us and prepared us for the worse hence the meeting will never hold in Awka, and Ohaneze and Nnia Nwodo should be held accountable for any death or injuries on our people since he enjoys the death of Biafrans and always sees it as an avenue to please his pay masters in Abuja whose bidding he is doing because of money and cheap popularity. Until these elders who place their personal greed above the people's need tow the path of honour and dignity, they will never have peace. The will of the people must prevail!